You don’t have to have a western themed home to embrace the horseshoe. Horseshoes are now almost a staple in modern and rustic decor. There are some really talented Etsy sellers that have mastered the art of crafting with horseshoes and I envy them most days! I only have horseshoes from my horseback riding days and finding them at the barn. I also have some vintage horseshoes from my grandfather when he worked on a farm in Wisconsin as a boy. I treasure those horseshoes and I don’t think i could alter them in any way. However, I do plan to look for some horseshoes at antique shops this summer – and you can too! There is a debate as to which way horseshoes are to be hung in a home. Some say that hanging them with the open side upwards keeps all the good luck in the home. If the horseshoe is turned upside down, the luck will fall out, which will bring bad luck to the home. Others seem to say that turning the horseshoe upside down lets all of the luck pour out into the home. For me, an upside down horseshoe makes me cringe! 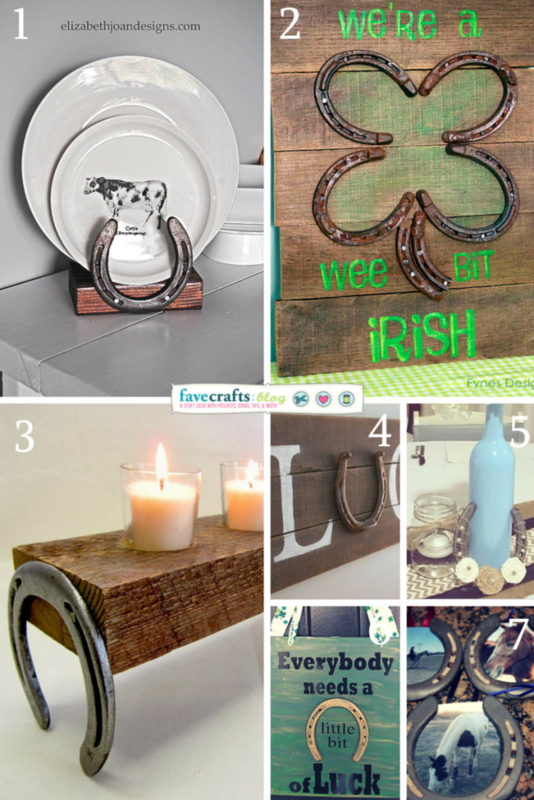 With St. Patrick’s Day coming up and my love of horseshoes and anything related to horses, I’ve gathered up 7 Lucky Horseshoe Crafts we can all try. Similar to the horseshoe debate, there is also the “lucky” debate between four leaf clovers and three leaf clovers. Growing up, I always knew that finding a four leaf clover was next to impossible – but after hours in a field at day camp, I finally found one. But if you’re Irish (and I am a little bit Irish), you know that the three leaf clover is the traditional symbol, the shamrock. People tend to get hot-headed over this difference for some reason. I promise you, no matter which way you hang your horseshoe or which clover you like best, there’s lots of good luck to spread around before St. Patrick’s Day! Horseshoes up or down? Three leaves or four? This tutorial is brought to you by Latrice Murphy for Any Occasion. Chalkboards are all the rave right now and making them has become my new DIY favorite. 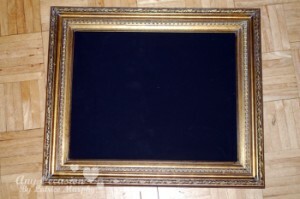 I found this amazing gold frame at my local thrift shop for just $3! It’s about 24” X 18” and chunky. It just needed a good cleaning and a backing of some kind. Which made me think … CHALKBOARD! Give your frame a good cleaning by just wiping it down with warm soapy water. Give your plywood two or three coats of chalkboard spray paint and let dry between each coats (at least 15 minutes). 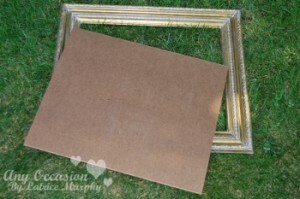 When it is totally dry, turn your frame over and hot glue all around the four sides. 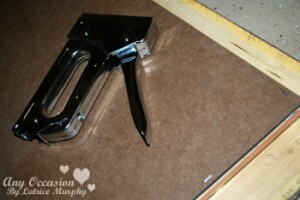 Next, you want to let that hot glue cool and them using your staple gun with at least ½” staples. Staple all around the four sides as well. Season your chalkboard by rubbing a piece of chalk vertically all over and then horizontally. This will prevent any ghosting or shadowing when you’re ready to write. Find ideas on Pinterest and other places around the web for chalkboard art and have fun. I haven’t quite decided on what to write on mine yet. I’ll be sure to share it over on my blog when I do. This chalkboard will be the one that is up most of the year and the wording will change with the seasons. Thanks for stopping by. This was a fun and quick DIY. I hope you go out hunting for a great deal to create this project, too. This post is brought to you by Mary Egan of Craft Foxes. We all know that times are tough and you can’t always afford to buy new crafting materials or supplies. But never fear – there are crafting supplies and opportunities right under your nose! 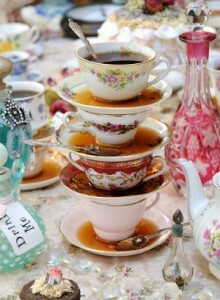 Your teacup collection can become a new dessert stand and old sweaters can become smart accent pillows for the couch. The possibilities are endless when you start to view everything through the lens of upcycling. Upcycling is a great way to create new and exciting items out of things you already own and may not use. Here are four fun upcycling crafts that might just spark your innovative side. 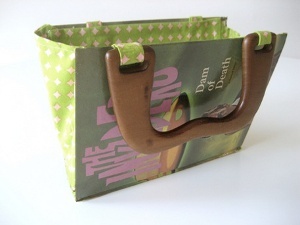 This book purse is one of the most popular upcycled craft ideas. 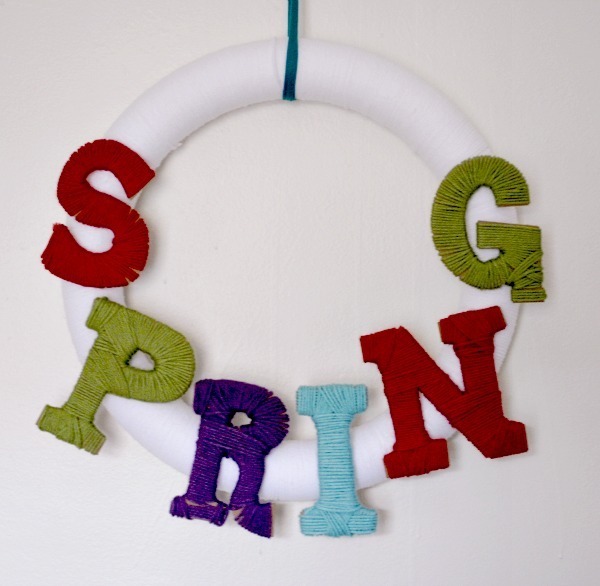 It may pain some bibliophiles to dismember their favorite stories, but this is a great way to show your appreciation of the written word and display your crafting skills. 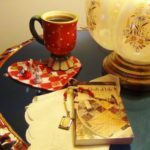 For this craft, you’ll need an old book, some fabric to line the inside of your handbag, glue, a utility knife, and a sewing machine. 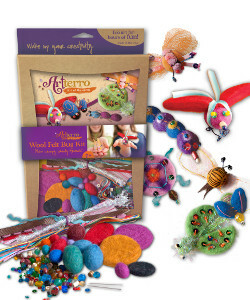 It’s a great craft for book lovers of any age, but also a great craft for teens. Use this craft as an opportunity to teach them that they can make their own fun and unique handbags without spending a great deal of money. Let’s face it—we all have t-shirts lying around that could use some jazzing up. Rather than leaving that blank, white t-shirt all crumpled at the back of your dresser drawer, why not upcycle it and create a whole new piece of clothing? This cool, DIY t-shirt design can be done simply with some fabric paint and the eraser on a pencil. Simply dip your eraser into the paint and begin creating a pattern you’d like on your T-shirt. Create any shape or design — it’s up to you! 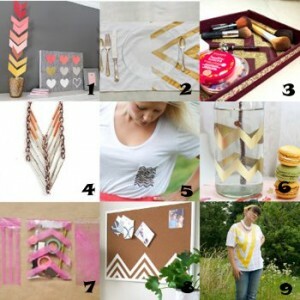 For more great upcycling ideas, check out 11 Creative T Shirt Crafts for Kids and Teens on FaveCrafts. Visit CraftFoxes for more information on how to upcycle an old T-shirt! Teacups are a beautiful accessory to keep around the house and you can even use them to create new home decor pieces. For instance, teacups make great candleholders! They can become light fixtures, flower pots, dessert stands or even wall clocks. The great thing about teacups is that they come as ready-made crafting pieces. 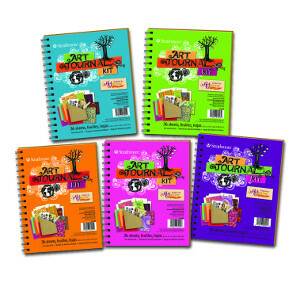 They already have gorgeous designs on them—all they need to add is your imagination. Once you’ve finished creating a Teacup Candleholder, create a Teapot Flowers Topiary for your table. At the end of winter, you might find that you have some sweaters that no longer fit you, or you simply don’t like the look anymore. Here is a fun and frugal way to recycle those sweaters and create a pretty patchwork accent for a couch or armchair. 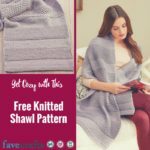 You’ll need to cut your sweaters into eighteen 7-inch squares to cover a 20-inch square pillow form. Simply sew the squares to the pillow and you’ve got a great new piece with which to decorate your home. Still in the mood to create? 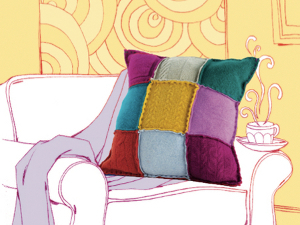 Check out another creative tutorial for Recycled Sweater Throw Pillows. Have you tried any upcycled crafts lately? What did you make? It’s amazing what you can do with leftover materials lying around your house. 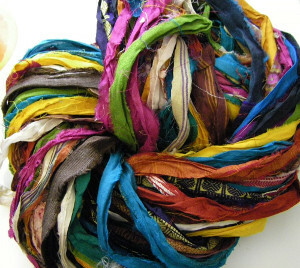 Your closet, for example, is a treasure trove of material perfect for refashion projects. This Earth Week, celebrate by creating upcycled projects that are totally simple to make and useful. Reusing fabric and material you have on hand will not only help you make awesome new projects, it will help reduce your carbon footprint. 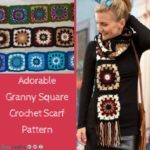 FaveCrafts is happy to offer up crafty ideas that will inspire you to create with the earth in mind! 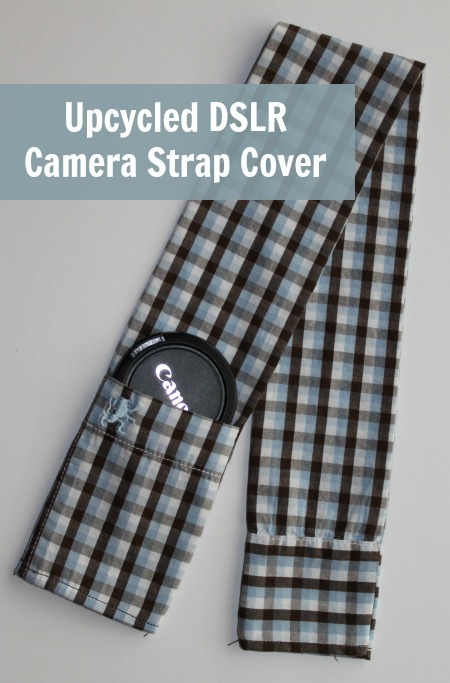 Day five of our special Earth Week celebration includes a tutorial for an Upcycled DSLR Camera Strap Cover. With just a few supplies and these easy steps, you can make yourself a lovely little cover free of a heavy price tag. And since we’re celebrating all things Mother Earth, this project calls for shirt material you already own. 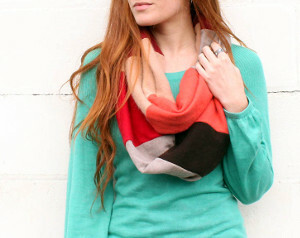 It’s time to reduce, reuse and refashion with our friend Calley, from The Eco Chic. Step 1: Cut a piece of fabric approx. 27”X8” and option lens pocket (to desired size). 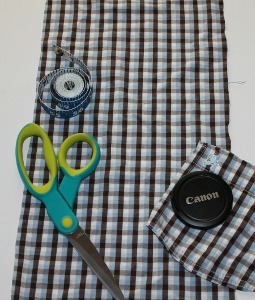 Step 2: Place the lens pocket in place at one end of the fabric (on half of the fabric only). Sew around 3 sides of pocket leaving the top open. Step 3: If you prefer a padded strap you can add the padding to the back at this time. Hem both ends (the 8” width) of the strap cover about 1/2”. Step 4: Fold the 27” length in half with fronts facing each other and pocket on the inside (it should be folded to approx 27”X4” at this time). 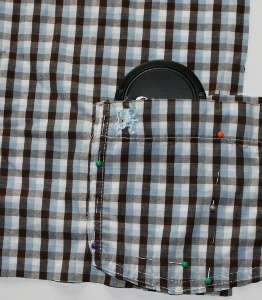 Using your lens cap as a guide, measure the desired width and pin both sides of the strap cover. Sew along the length of the fabric being sure to leave the short ends open on each end. Step 5: Trim the edges and flip so that the right-side of the fabric is now facing out with the pocket at the bottom of one end. 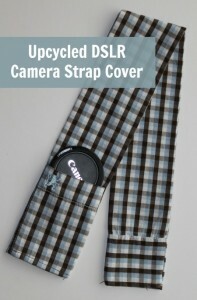 Iron flat and feed your camera strap through the cover. Step 6: You are now a trendy photographer! When taking pictures you’ll never lose your lens cap again because it will be stored safely inside the pocket. Depending on how wide your pocket, you may be able to fit your cell phone in the pocket also. Note: The sample shown here was not padded but some photographers prefer padded straps. Also, adding elastic to each hemmed end will help keep your strap cover in place. About the author: Calley is an eco-junkie and mom of 2. I love crafting with repurposed or upcycled materials and have recently taken up photography along with my numerous other hobbies. For more upcycled crafting projects please visit my blog The Eco Chic. What’s the most creative thing you’ve made with an old shirt? 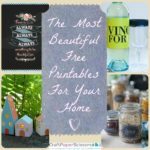 One way to cut down on the waste cluttering our planet is to use what you already have in your house or that you can easily get, but you also don’t have to fill your house with old things. Upcycled crafts are the perfect way to renew and reuse things that you might think are out of style or useless. Giving a used item a makeover is a fun way to exercise your creativity, save some money, and show respect for our planet. 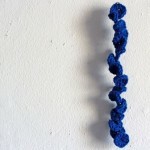 Today, FaveCraft.com’s celebration of our lovely blue planet continues with another innovative, Earth-friendly craft. *This contest is now over. Please enjoy the free tutorial below. Day three of Earth Week brings us to a fantastic tutorial involving a chair. Nicole from Darn Good Yarn walks us through the surprisingly easy process of giving an old chair a new look. With a couple of simple materials you can create a fun and funky chair for your household. 1. Cut the yarn into strips and tie them where you want them. 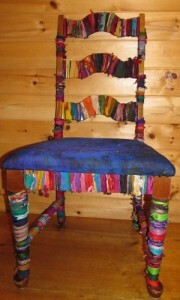 For my chair, I wrapped the yarn around the chair legs and tied them, then tacked it down with a dab of glue. 2. I popped off the seat cushion and reupholstered it with one of my Reclaimed Silk Scarves. You can also re-foam the chair if you need to. 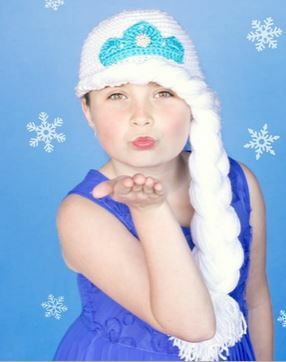 Thanks again to Nicole from Darn Good Yarn for allowing us to share this tutorial! 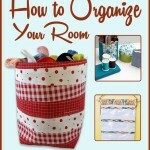 Looking for more ways to use yarn and ways to refurbish other items in your home? You’re in luck! 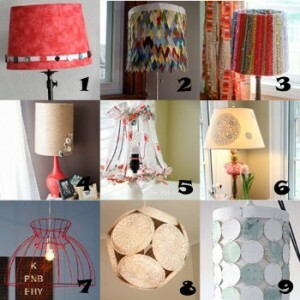 What is your favorite way to upcycle items? We’ve all heard the “reduce, reuse, recycle” mantra, right? Well we’re giving that old incantation a bit of an update… Get ready to “revamp, repurpose, and revitalize” with these eco-chic DIY jewelry projects! In honor of Earth Day, we at AllFreeJewelryMaking are pulling together some of our all-time favorite jewelry tutorials using recycled materials. 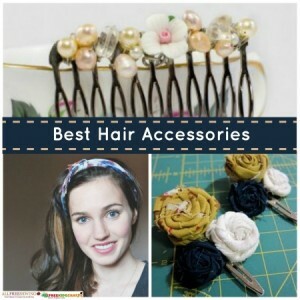 “Go green” and get gorgeous with these Earth-friendly and fashion-forward DIY jewelry ideas. 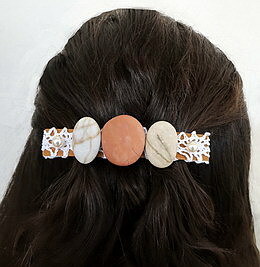 Not only will you save some trash from the landfill, but you’ll save yourself a bit of money by upcycling materials you already have at home into fresh and fabulous DIY jewelry. 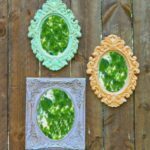 Instead of going to the craft store the next time you need jewelry supplies, you’ll be heading to your favorite fast food restaurant after you see this DIY idea. 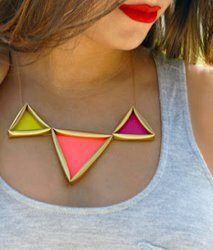 Would you have guessed this Golden Neon Pyramid Necklace was made from drinking straws, paper, and paint? Bet you’ll think twice before tossing that fountain drink in the trash. Give yourself an excuse to swing by the drive-thru of your favorite burger joint by putting this knockout statement necklace on your “to-do” list. 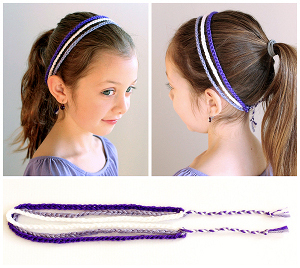 Make a bracelet that really pops with this cool recycled bracelet project. Different versions of this DIY Pop Tab Bracelet have been popping up all over the blogosphere, but this one from Taking Off At Nine is really top notch. 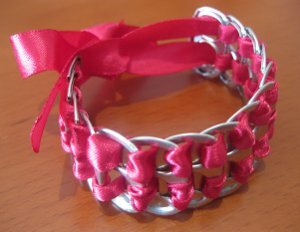 The pink satin ribbon gives it an ultra feminine touch and adds some softness to the silvery tabs. So cheap and easy to make! Doing some redecorating? 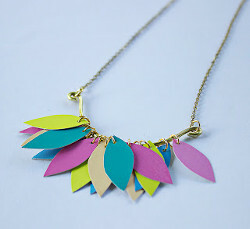 You might as well redecorate your wardrobe while you’re at it with this Paint Chip Petal Necklace project. Save those leftover paint chips the next time you’re giving your home a fresh coat and turn those colorful scrap cards into your next necklace creation. 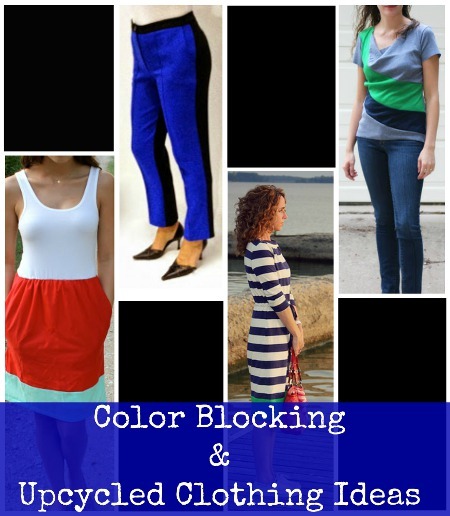 You can add a splash of color to your walls and your outfit all at once. Got the itch to make some earrings? 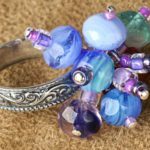 We prescribe this tutorial for Jewelry Made from Recycled Plastic Bottles to relieve your jewelry making urges. Poppy from Poppy’s Money Tree House is clearly doing her part to save our planet with these clever recycled jewelry designs. Use a prescription bottle to get the amber effect shown here, or use any empty plastic bottle you have lying around to create your own version of this project. Not all repurposed jewelry projects have to come from the recycling bin. This 6-Minute Upcycled Necklace revamps an old piece of jewelry into something fresh and fun. Give new life to those old forgotten bead bracelets lying listlessly at the bottom of your jewelry box, or revitalize some retro accessories picked up from a second-hand shop. 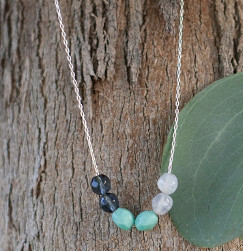 All you need is a few beads to make simple and sweet necklaces like the one shown here. These jewelry projects prove that you can be elegant and environmentally conscious all at once. 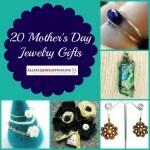 If you’re looking for even more ways to save the Earth and some cash while crafting, check out Chic Recycled Crafts: 10 Recycled Jewelry Tutorials to find a roundup of our top 10 most popular recycled jewelry projects on AllFreeJewelryMaking.com, as chosen by our readers. Go glam and go green at the same time with these Earth-friendly ideas. 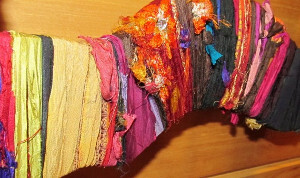 Have you ever used recycled or upcycled items in a craft or jewelry project? Tell us about it!